It was time to redefine the Corporate Traveler brand to attract a different area of the market. We developed a modern, more sophisticated brand identity to better reflect the demographic Corporate Traveler needed to attract and shed the fun/cheap aesthetic. The key objective was to shift Corporate Traveler’s portfolio of clients toward a higher tier of travel spend. I collaborated with a global team of marketers to determine our approach, launching internal and external workshops, surveys, and workshops with current clients as well as a small audience of potential prospects. 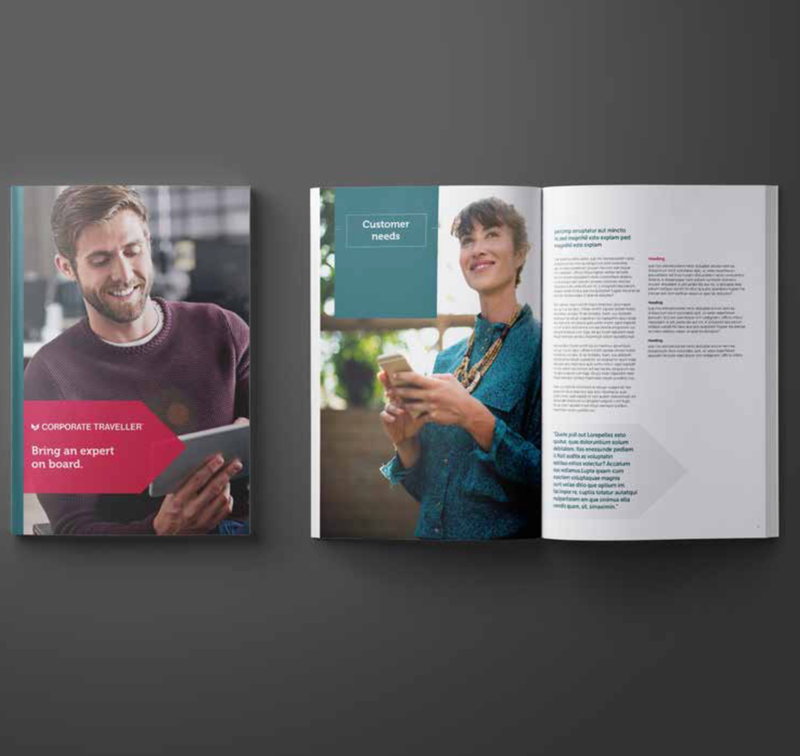 Printed handbook designed specifically for Sales teams. To launch, I tackled this with my team as a two pronged project, including both internal and external campaigns. We launched a handbook to all sales staff and sent out multi-email messages teasing the launch to our staff. We also held a competition and promoted with a series of fun videos announcing the new look and feel months before launch. Sample wall decal provided to offices to select for fit-out. Corporate Traveler’s client mix, approximately 18 months since launch, has started to show some positive signs of growth with a positive up-swing in average travel spend of 13%.